Athletes and professionals alike will love having their IDs or keys hanging from these lanyards! 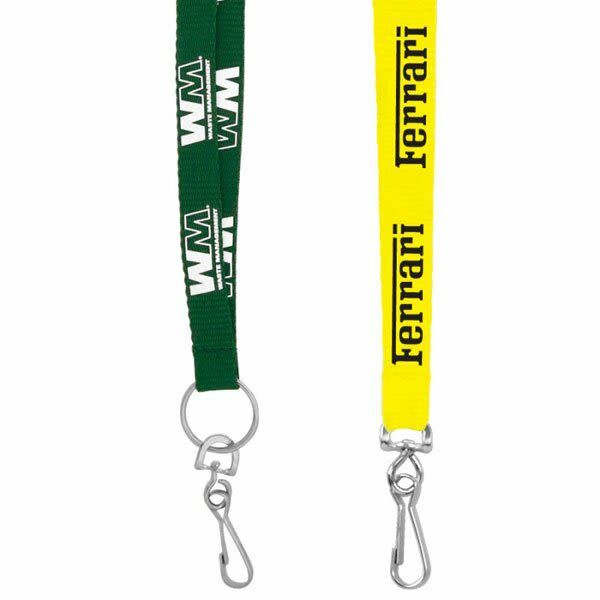 A very affordable promotion, these custom screen printed lanyards will have your brand or business name spread far and wide! Price includes a one-color, one-side, repeating imprint. The price also includes an attachment of your choice - see all images. Metal and break-away attachments available at a cost. Second-side and multi-color imprints are available for additional costs and set-up fee per color. Please allow three weeks for production time. Faster turnaround is available for an added cost. Can be individually packaged for an added fee as well. Please call for further information. If you’re looking for affordable items for your next industry trade show or corporate event, you’ll definitely want to pay some attention to our ½” custom screen printed lanyards. Worn around the neck, our cheap promotional lanyards are the perfect tools for holding ID badges, neck wallets, name tags, and access key cards. One of the best things about these affordable lanyards for trade shows is that they offer a lot of variety and personalization options. For one thing, you can choose the type of attachment you want. 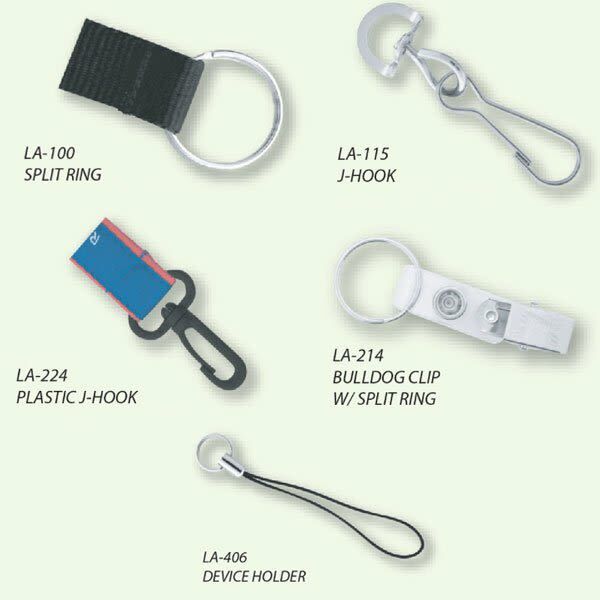 Select your best fit among plastic or metal J-hooks, bulldog clips, split rings, or small O-ring device holders. You also get to take your pick among 16 colors, so you’re sure to find one that complements your company logo. 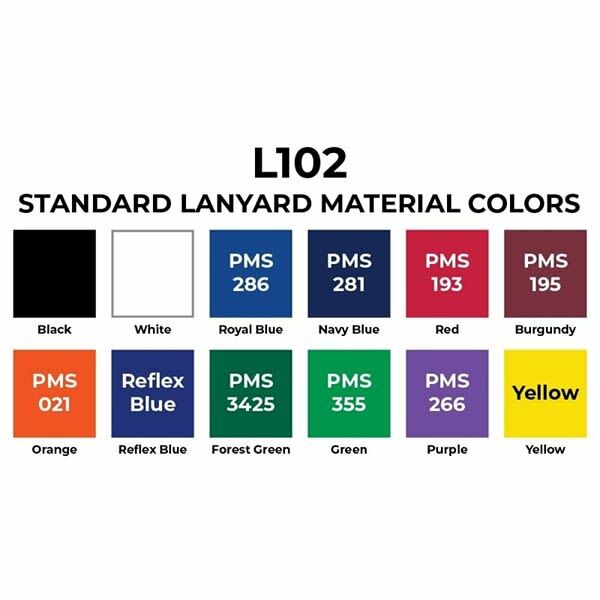 When it comes to the measurements in the titles of our lanyards, the number usually represents the lanyard’s width. That’s why our ½” custom screen printed lanyards are dubbed “Screen Printed Lanyard .5 in.” So now you know that the lanyards on this page are a half-inch in width, we should probably also mention that they’re 36 inches long. The imprint area runs for nearly the whole length of the lanyard in a repeating pattern, with one color logos included in the listed price. For an additional charge, multiple color logos are available, as are double sided imprints, expedited shipping, and individual polybagging. You may have noticed in the bullet list above that we give the width of the lanyard as ½” but the width of the imprint area as 32”. This isn’t a misprint; while lanyard widths are measured by the width they have when held upright, the width of their imprints is measured by the width the designs take up the the lanyards are laid out horizontally. One more upgrade we should mention is that these ½” custom screen printed lanyards can also come with a breakaway release. These are handy for when the lanyard gets stuck and users need to free their attached items. Even more importantly, they can prevent strangulation when a lanyard is stuck and pulls tightly around a user’s throat. Do you like this size and design but want to see what we have in different styles? If so, you’ll want to click the following link to view our cotton ½” custom screen printed lanyards.